Julbo is a favorite brand along trail runners. Great looking sunglasses with high quality frames and lenses. Their catalog is limited and does not offers as many products as other brands, but you will find something that fits you. Last year we reviewed Dust and had a great success with them. This year we reviewed Pipeline and Ultra! Fit: Very large lenses and frames, which have have a tendency to come in contact with the eyebrows and cheeks. Earpieces are very light and flexible. These were the largest lenses of the tested options. The construction has the least amount of rigidity of the tested options, and is very easy to bed and flex. glasses. In full sun, they darken a fair amount, but not quite enough for my liking. Venting/Antifogging: The lenses are heavily vented by virtue of being attached only at the nose piece, and therefore are very resistant to fogging. Best For: Lower-light days, light rain or light snow conditions, sunny-day runs on trails. Drawbacks: Not ideal for full-sun due to incomplete darkening of the photochromic lenses. Definitely the coolest sunglasses in this review. 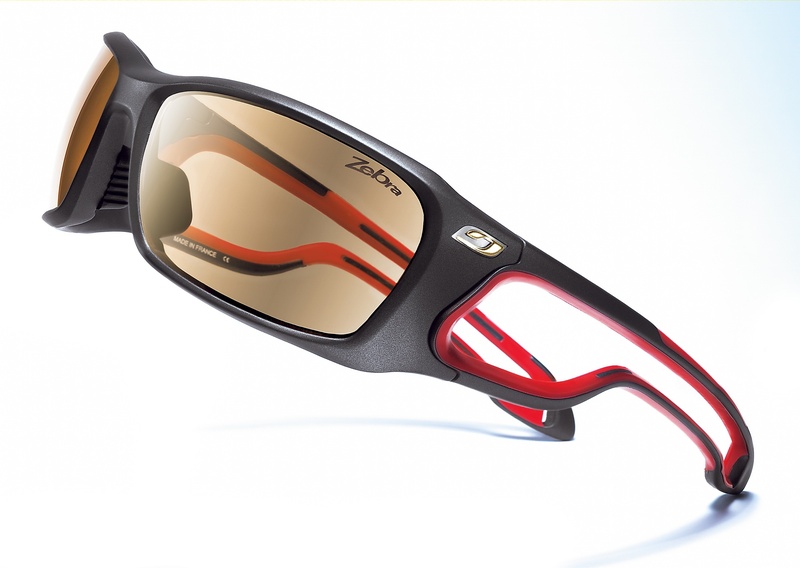 Pipeline offers "zebra" lens technology which is a photochromic lens. It can change from a light transmission rate of 42% to just 7%! Its anti-fog coating, directly integrated via laser, guarantees maximum efficiency and long life. Pipeline is the most expensive product in this review, $180. Fit: Pipeline looks massive at first but the cut outs of the frame makes them very light weight. Pipeline fits close to your face and stay put during all kinds of test we have been throwing at them. At times strings of sweat interfere with the vision as the lens comes really close to face. Sun Blockage: These glasses feature photochromic lens with Zebra technology that works really well, for the weather conditions in NJ. Lens darkens for a comfortable blockage quick and at the same time offers comfortable vision for a cloudy day. Venting/Antifogging: Pipeline fits very close to the face, so the fogging was something that worried me. By the big cut outs and the lens treatment the Pipeline did not fog up. Condensation has occurred on humid days. Best for: Pipline looks really cool and other runners will definitely ask you about them. They sticks out in the crowd!. Pipeline and Julbo really offer high quality products and Pipeline is not exception. Pipeline runs really close to the face and would be a great option on a trail run, as they offer great protection and the lens works well with the different sunlight you might experience during a trail run. But don't be afraid to use them on the road as well. Julbo is more then trail running! Step price tag but the Pipeline and Julbo is quality! Drawbacks: The price tag is steep, at $180. The Pipeline might not be the best option an a humid day as we experienced condensation. If you wanna be the coolest runner at the race. Pipeline is the way to go.